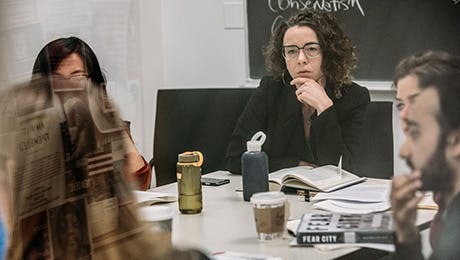 Courses in the Department of Psychology pair historical theory with modern research, offering students the opportunity to understand how people think, how people live, and how people make sense of the world. Our courses cover the most important-and most misunderstood-issues of our time. This course surveys research on psycholinguistics, cognition, and the relation between language and thought. Topics include the psychological reality of grammars proposed by linguists; individual and dyadic processes in language planning, production perception, and comprehension; meaning, categorization, and knowledge representation; universals in language and thought. This course focuses on the theoretical and clinical interventions in child, adolescent, and family therapy. The section covering intervention work with children also encompasses parent-infant psychotherapy, individual child psychotherapy, and intervention work with adolescents. Theoretical perspectives focus on psychodynamically oriented treatment but special attention is also paid to evidence-based treatments. Family therapy is covered with special reference to systemic approaches. We focus both on theoretical background and case material. The self-help industry grosses over two billion dollars a year, yet surveys repeatedly show that Americans are not getting happier. One reason for this is that most self-help books are not based on critically evaluated research related to happiness. We will learn how rigorously conducted research can inform our understanding of what influences people's subjective wellbeing, and examine different approaches to the study of emotion. Throughout this course, we will discuss such questions as how material wealth relates to wellbeing, whether religious people are happier than atheists, how culture influences emotion, why happiness seems to come easier to some people but not to others, and whether happiness is an important (and achievable) state to begin with. We will read the latest research articles in psychology, sociology, and economics to gain a better understanding of a wide-range of emotions, including gratitude, nostalgia, regret, envy, and so forth. Memories can serve as the foundation upon which identity is built. This seminar will review work on the formation and characteristics of autobiographical memories and explore how they contribute to identity. This course will explore how we think about and communicate with others. The course will consist of three parts. In the first part we will examine interpersonal conflict. During this part of the course we will explore the most effective strategies of advocating for one’s interest. The second part of the course will focus on how we make social attribution about others. It will discuss systematic errors made in thinking about others as well as the most effective strategies for understanding others. In this section we will explore factors such as empathy, trust and perspective taking. The final section of the course will explore how a social environmental context influences how we think and communicate with others. In this section we will explore factors such as the role of gender, race and culture in interpersonal relationships.